Use: Seafood, vegetable, pesto and pasta. Fragrance: Light fruity, with scent of ripened olive, artichoke and sweet almond. Rossana Zappa and Roberto Tozzi are the founders of the VisAmoris Farm. 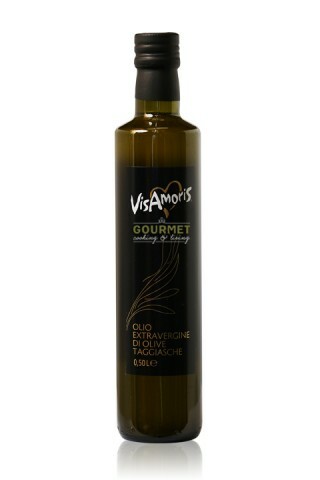 VisAmoris was founded in 2003 in Liguria, near Imperia, from an apparently harsh land that proved to be quite fruitful. They started with a little vineyard approximately one half acre big, located on hills and arranged with terraces, about 2 miles away from the Ligurian Sea. Thanks to an established winemaker Giuliano Noe and to an experienced agronomist (Piero Rose), who was passionate about the project, the first “Pigato” was born: Visamoris Dome’. (The grapes Pigato are typical from Liguria but were originally imported from Greece in 1830). The first results were encouraging and prompted Rossana and Roberto to continue. They gradually bought little plots of land in the same area that had not been cultivated for more than 30 years, with the intent to expand their farm and to improve the local terroir. Later on, Rossana and Roberto met Igino and Davide Gelone, father and son experts in Taggiasca Olive Oil and certified masters in olive oil tasting. They were very attached to the region of Liguria and its lands. After several years and many dinners together, they decided to unify their passions and abilities by becoming partners and started producing artisanal extra virgin oil from Taggiasca olives. The whole production comes from their own olive plants; therefore very limited, yet very high quality. The company owns 1500 Taggiasca olives trees that are between 50 and 200 years old. The farming is done on hills arranged in terraces that are very difficult to access with machinery. The harvest process is particularly meticulous and accurate in order to guarantee a product totally intact during milling. The small quantities of olives are milled at the nearby mill that ensures that all olives are processed within the same day as harvest. The entire production process is carefully done under Davide’s supervision. Taggiasca olives ripen at different times between October and January. Thus, harvesting is done several times. Mechanical means are used, by shaking the trees and allowing the olives with the perfect grade of ripening to fall off the tree. In addition, a small quantity of olives are harvested early, while still green, to add the perfect level of fruitiness and spiciness, but without changing the most important characteristic of the Taggiasca olive oil: the sweetness. The olives from VisAmoris are also certified DOP Riviera Dei Fiori. In conclusion, love, passion, knowledge and a pinch of craziness are the heart of the VisAmoris Farm.